Cannabis Just Got More Awesome – Now You Can Build Your House With It! The cannabis plant is like the MacGyver of the flora universe. Now, you can build your house using hemp fibers! The cannabis plant is like the MacGyver of the flora universe. The plant that can be cultivated for its THC-containing marijuana buds or its durable hemp fibers has fulfilled the needs of humanity for thousands of years. Now, you can build your house using hemp fibers! Thousands of years ago, hemp was used to make textiles, pottery, clothing, and even buildings. Early cultivators would take hemp fiber from the long stalks of the cannabis plant and weave them together to make durable hemp cord that could be used as framing for buildings. As pro-hemp legislation begins to take hold in America, we are experimenting with the fibers just as ancient civilizations did. Guess what—the applications for hemp are still the same as they were 10,000 years ago. For decades, Europeans have been using a mixture of hemp, water, and lime to create what is known as “hempcrete”. 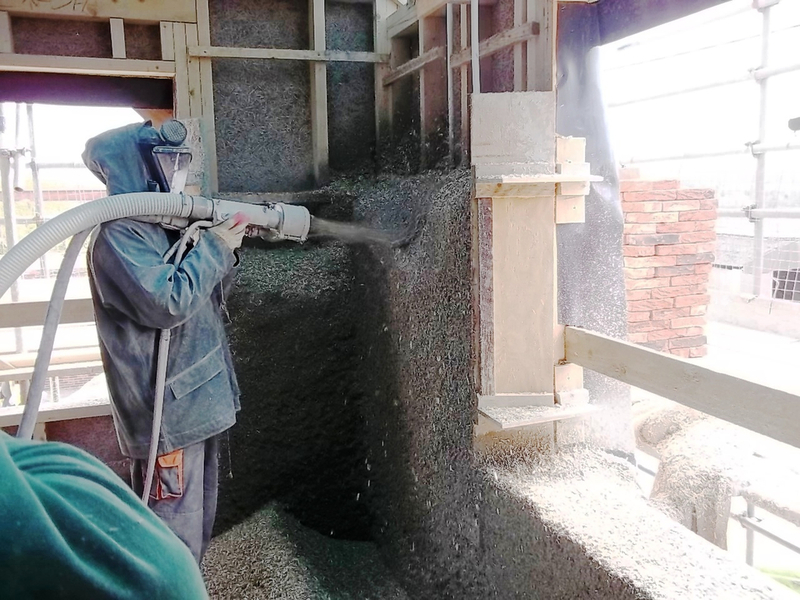 Hempcrete is made using the pulpy center of cannabis plant stalks, and when combined with lime and water it becomes a solid yet breathable concrete-like material that is ideal for insulation in homes and buildings. The technology was developed in France in the 1980’s, and because hemp cultivation has not been outlawed in most of Europe, hempcrete caught on quickly. There are countless homes throughout Europe that are built using hempcrete, including a home built by Prince Charles. In fact, insurance companies in England provide discounts for homes that are built using hempcrete because of its durability. Unlike concrete that is made from mined stone and sand, or fiberglass that is made from synthetic materials, hempcrete is made from plants that are obviously a renewable resource. Using hempcrete for buildings brings a new meaning to “going green”. “I know, I know, everyone talks about our buildings going up in smoke, but the joke is on them,” Mr. Savage said. So, don’t even think about trying to head over to your neighbors hemp house to procure a residential joint. Not only is the hempcrete inflammable it contains by law, less than .3% THC on a dry weight basis. You would have to smoke an entire field worth of industrial hemp to get any kind of buzz—your lungs would quit on you before you feel anything. American prohibition of cannabis cultivation has limited our scope of industrial applications for hemp for decades, but if the flood of innovation with marijuana products is any indication, the future uses of hemp will be astounding. If you are interested in getting your hands on some hemp building materials, check out Original Green Distribution. The Minnesota based building materials company is a leader in hemp building products, and because their industrial hemp contains less than .3% THC, they can ship their products anywhere in the United States. Would you live in a hemp house? Let us know on social media!